So I am interested in using a flightsuit in the future for my pet bird. However, I see you guys recommend a harness, and I like the flightsuit because of the diaper feature. Do you think it is safe to use as a diaper, and as a harness as well to keep the bird safe from flying away ? 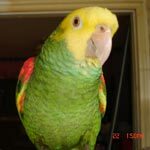 It has a very small length leash that I cannot hold onto if I want my parrot to be on my shoulders, Is there a place I can get a leash that is not too long nor short to use with the flightsuit? (It has a ring you can connect a leash to). 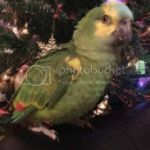 I use the Flight suit, You can get a longer leash if you have a large parrot but for a smaller parrot I would recommend wearing the harness over the flight suit. It cant cause infections You could try find a very light weight lead used for smaller animals (Rabbits, Puppies) preferably one made of bungee cord. Just had a read and I see what they mean about causing (infection) maybe it could if you weren't changing out the pads often especially if the bird poops a lot. well I am pretty sure My cockatiel poops every 20-30minutes. The website for avian fashions (Flightsuits) says to change it every 4 hours. That would be like 8-12 poops on a pad if I did do that. Seems like a lot. Maybe Ill change it every hour or 2? I have never used any sort of bird diaper. Rear vents can easily get crusted and sore if the poop is kept against the skin and allowed to press against it and the feathers soiled. The other problem with bird diapers especially with hen birds is the mess is held against the same vent that eggs appear from and an internal ovarian infection coud occur. House training works better using methods like Michaels. It is also cheaper and more enviromentally friendly than paying out for disposable diapers. When I have taken a bird out on a harness in the past and couldn't always allow it off me to poop I had a home made towell shoulder cover to protect my clothes. I don't dress my dogs up either. They only have basic dog coats for very bad weather for outside use only. Loriusgarrulus wrote: I have never used any sort of bird diaper. Rear vents can easily get crusted and sore if the poop is kept against the skin and allowed to press against it and the feathers soiled. Most people buy cotton pads anyway The poop is not supposed to touch the skin its held away and thats why you have to change it often and mine don't poop much and I always check it anyways.Personally I wouldn't like to wear something over my shoulders but they can be "birds" indoors but not in public lol.I'd actually like to learn more about these infections surely its not affecting my birds. terra81 wrote: well I am pretty sure My cockatiel poops every 20-30minutes. The website for avian fashions (Flightsuits) says to change it every 4 hours. That would be like 8-12 poops on a pad if I did do that. Seems like a lot. Maybe Ill change it every hour or 2? My birds don't poop much and I can easily check it, If its not too tight you can slip your fingers under and grab the pad and change it with a clean one. I tried Ione with Rainbow. It took me 30 minutes to get it on and it took 3 seconds for Rainbow to remove it.